Catching big fish is one thing – but landing them to order for the camera is something of an art-form...and one the Purnell brothers seem to be mastering. Developing quite an audience for his Youtube angling vidos, Richard took bro Pete along to Tear Drops to get film of a good winter carp being landed. And, instead of defying the odds to get one to order, they got two – one apiece to 16-9. Check out their video under Carp Angler Richard Purnell. It's good...though you may prefer to mute the music! Richard has also donated his £100 MKAA picture-of-the-year prize to Willen Hospice. Good lad! 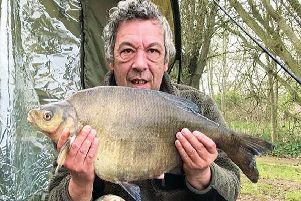 RISING temperatures have been bringing big fish, for some, on both rivers and stillwaters and on Parc Farm 2 Alex Hunt had a ball with a bream shoal, Sunday, and caught almost 100lb – mainly fish around the 3lb mark. ON Dovecote Bob and Matt Hayes, reporting via GoneFishin, found the pike bang on feed and had 25 to 17-12. ON the Ouse 'near Bedford' Den Reid had a 6-1 chub, while Mike Sando endured a torrential downpour to break a run of Ravenstone blanks with a 5-1. Olney's Ouse saw Pat Flynn get 10lb of roach on pole. Ross Deadman had eight perch around 2lb each in two sessions and Dave Partridge had a 3-5. NEWPORT's AGM put the club's £44 adult ticket up a quid...but Jack Sharpe won't complain as, next morning, he banked a 30-2 common from the Big Pit while Ben Ellis had a 23-12. Mark Levitt had a brace of good lumps, too. Fishing the club's river Steve Beale landed a 'hen's tooth' in shape of a 12-6 Upper Ouse barbel! CARP were moving on the Linford complex, too. Water's Edge staffer Darren Mayes had a 29-3, Paul Parrish a 29 (Pines) and Ben Meyerhoff a 26-8 (Heron). MKAA's individual league final round, on the Riverside Ouzel, went to Paul Chapman with 16-4 of roach to a pound! Steve Wright had 9lb and Mark Haynes 5-15. Wright won the league (65 points) with Paul Abbott on 62. Haynes, Chapman and Alan Ford all had 56...with Ford third on weight. OSPREY, twin matches on Decoy: Bill Boyne 130lb and Dean Townsend 7lb in one, Ian Millin 50-1 and Terry Goodman 40lb in t'other. ALDERS open: Trevor price 70lb, Matt Kearns 41lb, Richard Chapman 35lb. MK Vets, Riverside: Martin Cunniffe 7-11, Austin Maddock 7-10, Nigel Moore 7lb. Towcester, Astwell Mill: Tosh Saunders 5-8 (micro-rudd), Graham Martin 4-7-8, Tony Hirst 4-1. CALVERT, Claydon Lake: everyone blanked...back to the river next week! FIXTURES: Saturday, Olney Ouse open 01234 240061; March 11 MKAA grand slam, Ouse, 01234 713144.